Browse: Home » PRO WRESTLING!! 2016-01-12 · by Koto · in PRO WRESTLING!! 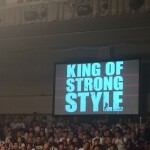 2015-05-30 · by Koto · in PRO WRESTLING! !